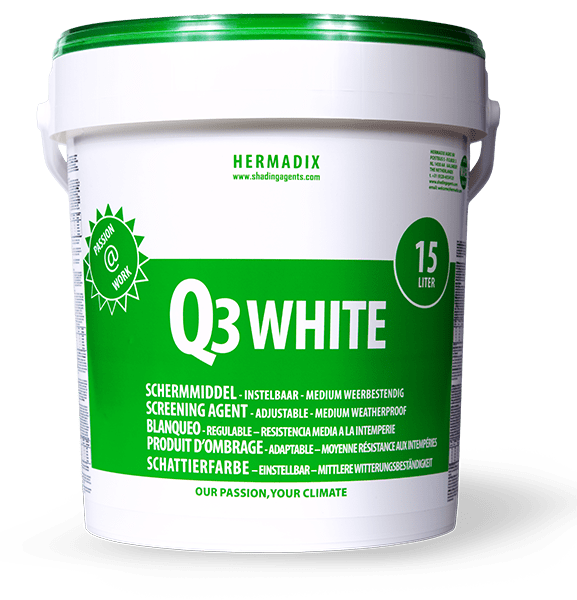 Q3 White is a shading agent that offers medium weather resistance and a flexible screen percentage. It has been developed specially for glass, film, polycarbonate and acrylate. Depending on the level of dilution, Q3 White offers medium wear resistance and can easily be removed with Removit. For maximum weather resistance at screen percentages under 65%, we recommend Q4 White. You can apply Q3 White in various dosages to achieve an optimum screen percentage. Depending on the level of dilution, Q3 White offers medium wear resistance. When applying by machine, you will need 1,400–2,000 litres of spraying liquid for one hectare of greenhouse. When applying manually, you will need 1,500–1,700 litres of spraying liquid for one hectare of greenhouse. The table below indicates the quantity of Q4 White required to achieve a certain screen percentage. Q3 White is very easy to remove at the end of the screening season by spraying with Removit. You can also let the weather wear off the shading layer naturally.